We can help with Headache pain and Migraines. Often Headache pain is caused by mis-alignment of the Cervical spinal joints causing circulatory and neurological dysfunction producing Headaches and Migraines. If you suffer from Headache pain – we provide Chiropractic Manipulation, Physical Rehabilitation, Therapeutic Massage and Myofascial treatments specific to the recovery of Headache pain . If you suffer from Headaches or Migraines ? Headaches are caused by a variety of reasons, but in 90 + percent of cases it is due to an increase or decrease of blood flow to the brain. This abnormal circulation often initiates in the cervical spinal column where the blood vessels flow through the spine, bringing blood to and from the brain. Arteries and veins work together as the body’s blood circulatory system. The heart pumps oxygenated blood to the body and deoxygenated blood to the lungs. Blood is oxygenated in the lungs and the heart pumps the oxygenated blood through the arteries to the brain and all systems of the body. The Veins return the blood from all the body’s systems, including the brain to the heart and the process begins again. If the blood going to the brain is inhibited (which can occur in the spinal column) this may cause an increase or decrease of flow to the brain, causing a headache or Migraine. 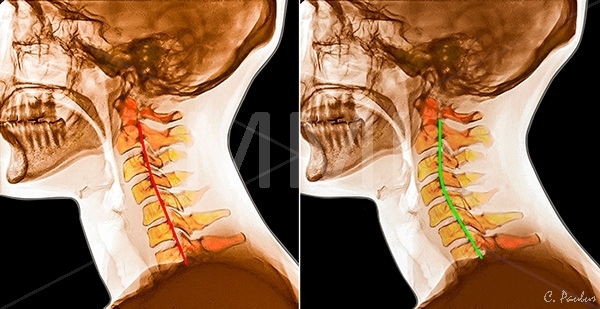 Chronic straightening of the neck or natural cervical curve as seen in the X-rays and MRI’s below can cause this decrease and increase in blood flow. Straightening of the cervical curve is caused by what chiropractors call subluxations. Some headaches are caused by decrease or increased circulation that occurs directly inside the brain. This though not a direct result of subluxations is often secondary as abnormal pressure can exist on the brain stem which sits at the base of the skull and extends out of the skull down to the level of the 1st and 2nd cervical vertebra. The 1st is called the Atlas and the 2nd the Axis. These 2 vertebrae are the most important vertebrae in the spine as subluxations here can cause a myriad of ill effects to the entire body, Headaches being only one of them. Impingement of the nerves or blood flow here can affect all of our organs and tissues (muscles, tendons, ligaments, Skin, bones, etc.) of the body. As a Chiropractor, this area of the spine is of major importance and all diagnosis of physical dysfunction begins here. Your Chiropractor should always make sure no subluxations exists at the Atlas and Axis (Or C1 and C2 as a chiropractic reference) for the reasons mentioned above. I have found in my practice that when subluxations are removed from this area of the spine the majority of headaches resolve and with a regiment of spinal corrective care (a series of spinal adjustments over several weeks or months depending on the severity) subluxations can be resolved and with continued monitoring through periodic adjustments, Headaches do not return. You should keep in mind – the removal of subluxations by your Chiropractor will not cure your Headaches directly speaking. It is the removal of pressure on the nerves and circulatory vessels that resolved your Headaches. IF you suffer from Headaches, are tired of the pills and other forms of therapy that have provided little success, you will most likely find results from Chiropractic care. 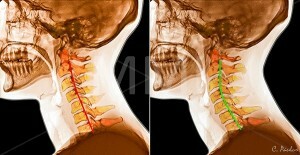 These images demonstrate the straightening of the cervical spine. This is caused by subluxation of or mal-alignment the joints of the spine and swelling of the surrounding soft tissue. Through a series of adjustments the image to the right is often the result which is a normal functioning spine. Look at the lower 2 images; you can see in the image to the left that the spinal cord is stressed due to straightening of the spinal column. 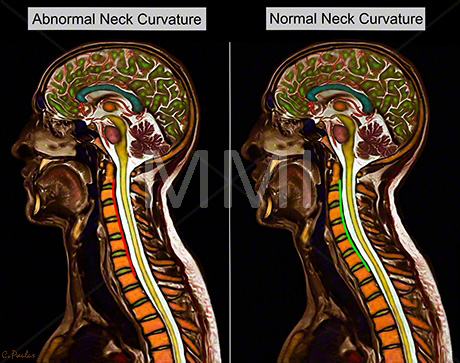 In the image to the right the neck or cervical spine maintains its natural curve and the spinal cord is relaxed allowing all systems above and below the cervical spine to function normally.